Using a very fake Steve Bannon email account, an email prankster has apparently tricked the editor of far-right news site Breitbart.com into providing a bizarre peek into his disturbing id. The UK-based prankster, who goes by the handle @SINON_REBORN, previously fooled White House staffers into arguing with fake versions of their coworkers by imitating their names with phony email addresses. 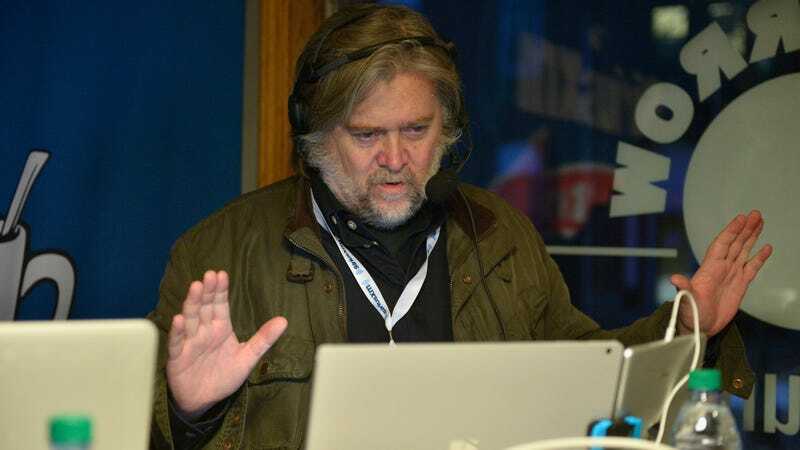 Now, the prankster has posted his correspondence with Breitbart editor-in-chief Alex Marlow using the email address “steven.bannon@usa.com”—even though the name of the Breitbart executive chairman recently ousted from the White House is Stephen Bannon. Fake Bannon responded by showing his approval of a Breitbart story suggesting Ivanka Trump “pushed out” Bannon. Then Marlow responded with an especially disparaging comment about Ivanka and Kushner: “Best conspiracy on the whole internet is Jared is an actual cuckhold,” suggesting Ivanka was literally engaging in the kind of infidelity that has become an obsession (verging on a verbal tic) for the far-right. In addition to Marlow, the prankster seemingly conned Breitbart editor-at-large Joel Pollak. And back in July, the prankster duped a number of White House officials: Homeland Security Adviser Tom Bossert was fooled by a fake Jared Kushner account; then-White House Communications Director Anthony Scaramucci was tricked by a fake Reince Priebus account; and Eric Trump fell for emails from a fake Donald Trump Jr. (yes, his own brother). Previously, @SINON_REBORN has gone after the CEOs of Goldman Sachs, Citigroup, and Barclays.